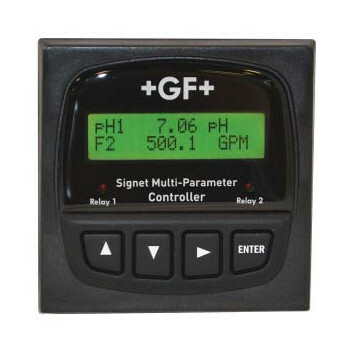 GF Signet 8900 Multi-Variable Controller for Flow, pH, ORP, Conductivity, Pressure, Level or Temperature Sensors. Accepts two or four input channels. Up to 4 analog outputs and 8 relay outputs. 1/4 DIN enclosure. NEMA 4X/IP65. UL Listed. 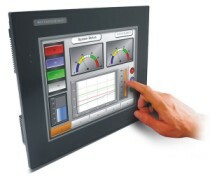 The Signet 8900 Multi-Parameter Controller takes the concept of modularity to the extreme. Each 8900 is field commissioned with the users specified combination of inputs, outputs, and relays using simple-to-install modular boards into the base unit. Configure the system by selecting either two, four, or six input channels which accepts any of the Signet sensors listed below, and/or other manufacturer�s sensors via a 4 to 20 mA signal converter (Signet Model 8058). To complete your unit, choose a power module with universal AC line voltage or 12 to 24 VDC �10%, regulated. If more features are needed, analog output and relay modules are available and easily installed. Plus, the 8900 will support four additional relays via an external relay module. There are other notable features that the 8900 offers. For instance, digital input to the 8900 enables longer cable runs and simplified wiring with minimal noise interference. Advanced relay logic allows users to select up to 3 measurement sources to trigger 1 relay. Derived measurements include difference, sum, ratio, percent recovery, percent rejection, percent passage and BTU. The menu system can be programmed to display in multi-languages including English, German, French, Spanish, Italian, and Portuguese. Universal AC 100 to 240 VAC �10%, regulated 50-60 Hz, 24 VA max. DC 12 to 24 VDC, �10%, regulated recommended, 7 Watts max. Analog Outputs (via I/O Modules and Output Modules) All analog outputs are freely assignable to any channel. Relay Modules All relays are freely assignable to any channel.